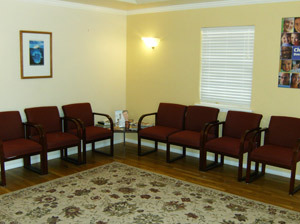 Please make yourself at home in our comfortable waiting area. As a new patient coming into our office for the first time, you should expect to receive a friendly greeting from one of our staff members as soon as you walk in the door. They will then assist you with filling out the required paperwork and answering any related questions. To ensure a quick and painless process, we typically ask for a copy of your insurance card (if you are choosing to bill your insurance), identification card, and a list of any medications you are currently taking. Paperwork usually takes anywhere between 10 to 15 minutes. Once we have all your information, one of our staff members will bring you back into an exam room where we will begin your consultation, starting with your basic physical information. Dr. Peters will be the next to visit you as a new patient and this will be your opportunity to discuss what is going on, any pain, issues, or simply to ask questions. Once Dr. Peters has gathered all the necessary information, he will determine how he can help you or meet your personal needs.